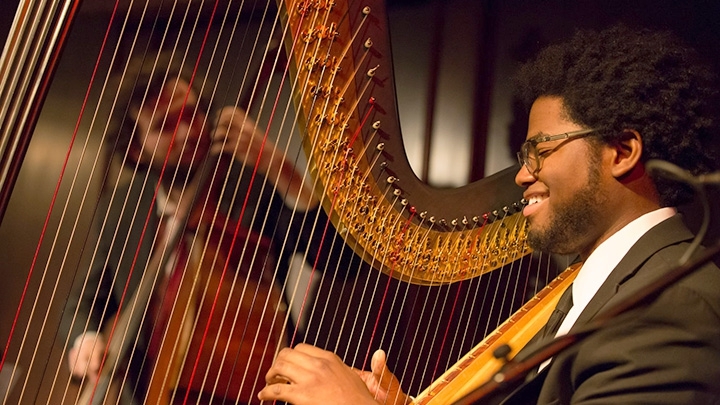 Charles Overton is a native Richmonder and a former member of the American Youth Harp Ensemble (now the Greenspring American Youth Harp Ensemble). He’s based in Boston, having graduated from Berklee College of Music and he maintains an active career playing jazz, classical, world music and just about anything else that he finds an interest in. Last summer, Charles released “Convergence” - his debut recording. Charles will play a concert with his jazz quartet Sunday, June 24th at Glen Allen Cultural Arts Center. It’s being presented by the Metro Richmond Chapter of the National Alumnae Association of Spelman College. Proceeds benefit The Della Bannister Book Scholarship Fund. I invited Charles to visit WCVE’s studios to perform a few solo selections and to talk about how he came to play jazz on the harp. The in-studio performances include “Alone Together,” “Hope,” by vibraphonist Ed Saindon and an excerpt of “Fantasy on a Theme by Haydn” by Marcel Grandjany.